PART ONE: Writer / Director Robert Boris talks with Justin Bozung of TV STORE ONLINE about his latest project THE NIGHT MARILYN DIED, his 1985 film OXFORD BLUES, and the possible sequel to the Rob Lowe film now in the works. BORIS: Susan came through one of the casting sessions. I wasn't familiar with her work prior and I didn't know her at all personally. But the actor, Jesse Dabson, who played Bob Slatzer--I had seen him before in a film and on a couple television shows. I thought he was very good. Susan, I liked very much and I thought she did a wonderful job as Marilyn. 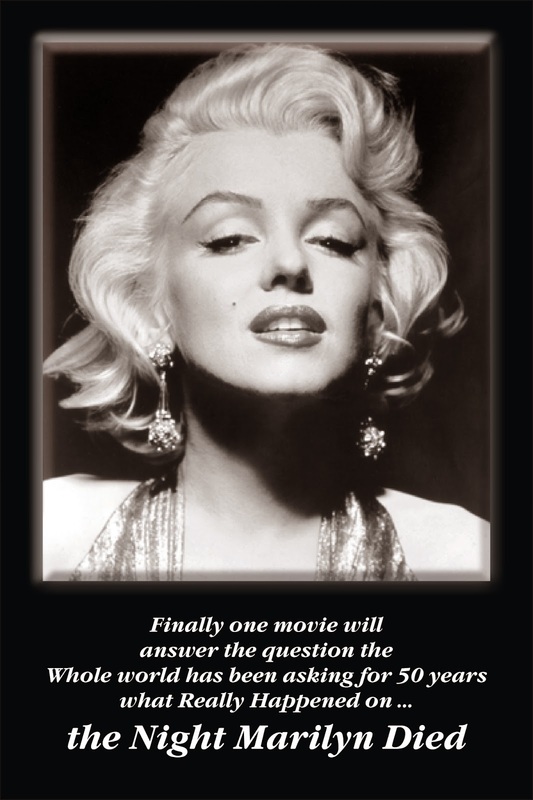 TV STORE ONLINE: And I believe you also have another Marilyn film in the works now, "THE NIGHT MARILYN DIED?" BORIS: That's correct. Here's how it happened. Years ago, I had met Robert (Bob) Slatzer when I was working on MARILYN & ME. He claimed to have married Marilyn Monroe when she was younger--as it's told in MARILYN & ME. We spent a lot of time together. We drank together. He was a good story-teller, and he had a lot of pictures of himself with her. You either believed him or you took his story with a grain of salt. He had written a couple books about her, and he had enough documentation to be credible. I believed his story, and so did [Stu Samuels] the film's producer, as did the executives at ABC. As we became friends, he began to spill a lot of information about their relationship and her sexual complications that we didn't cover in MARILYN & ME. Also, Terry Moore and Joel Grey had been cast in MARILYN & ME too, and they had both known Marilyn. Terry and Marilyn were once roommates, so she, like Robert Slatzer, had all kinds of new information for me about Marilyn. I started to collect all of this new information about her in a folder, and whenever an article would come out about her or a book about her final days--I'd add it to my collection. I've always been interested in docudrama. I like stories that actually happened. I once saw myself as a investigative reporter with a 35mm Mitchell camera. I have always been fascinated with the idea of Bobby Kennedy and Marilyn Monroe, and her twisted and sick relationship with her shrink. I've read incredible interviews about how Bobby Kennedy was in town and how he had taken a helicopter to see her, he saw her the day she died, and how Peter Lawford played into that. About a couple years ago--I started to dig even deeper into her life. Her final days are an amazing story. I've been able to piece together an amazing account of the last week of her life--and how she was courageous and heroic. She battled 20th Century Fox and took on everyone and out-smarted them at every turn. She was fired from SOMETHING'S GOT TO GIVE (1962) and sued for $750,000 dollars. She was so smart and clever that she managed to flip it all around though. She managed to flip Fox around, and not only was she re-hired for the picture, but George Cukor, the director, who had tried to get fired from the film--was fired himself, and after that, Fox ended up signing her for another picture which would've followed. There is no way she committed suicide. I've never believed it. 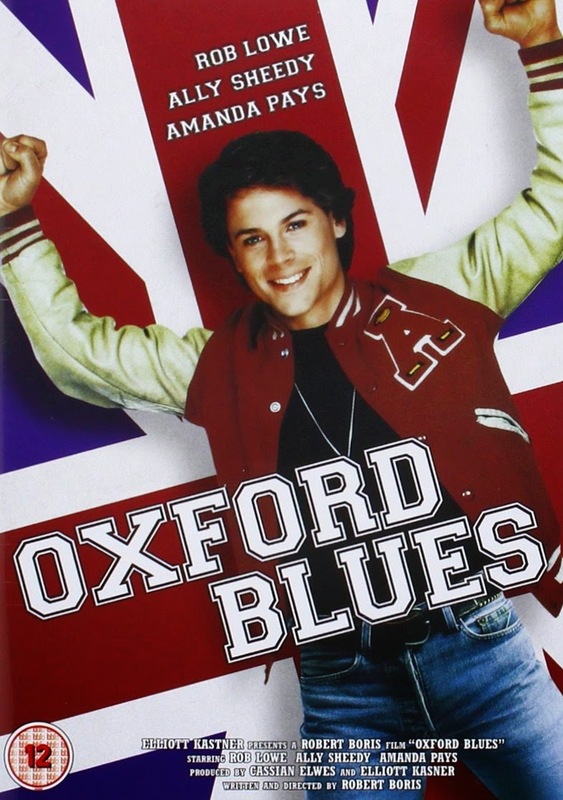 TV STORE ONLINE: I'm a huge, huge fan of OXFORD BLUES (1985)...I grew up with it in heavy rotation on HBO...I was wondering what was your inspiration was behind it all? 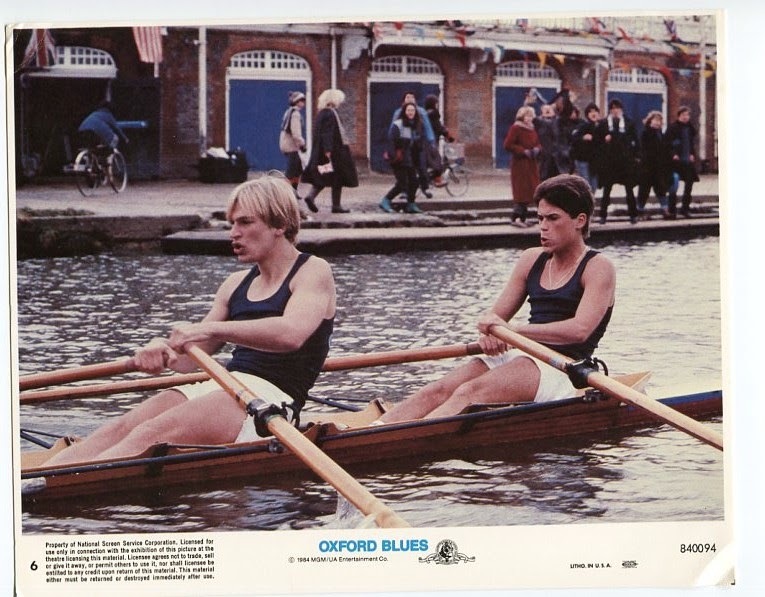 BORIS: Well, it's interesting you should bring OXFORD BLUES up, because it's just come back into my life again. I was just talking to the producer of OXFORD BLUES [Cassian Elwes] about a sequel--but before I talk about that, let me tell you how the film got off the ground. I was friends with [OXFORD BLUES Producer] Elliot Kastner. Kastner had also produced WHERE EAGLES DARE (1968) and HARPER (1968) with Paul Newman--he made many great films. Kastner optioned the very first screenplay I ever wrote when I was fresh out of college. I had known him from the start of my career, I knew him even before ELECTRA GLIDE IN BLUE (1976) was made. At some point around 1985 he said to me, "I have one million dollars that I need to spend. Give me a story that we can shoot in England right away." (There was a rule in those days, where if you made a certain amount of money with your film in one country you had to spent those profits in that same country or forego tax deductions on it.) So I came up with OXFORD BLUES. I knew it had to be a fish-out-of-water story. I knew it had to be an American in England. So I came up with the story, Kastner liked it and asked me how fast I could have it done. I wrote the script quickly. Kastner flew me to England and while I was over there, living in his house polishing the script, he began casting. BORIS: And the architecture of those buildings! It is a beautiful film. I, too, recently re-visited the film and it moves really well and it has a lot of heart. It's a great kids story of the '80s. BORIS: I saw Julian Sands first. I knew we had to put him in the film. Michael Gough is in the film. He went on to play Alfred The Butler and work with Michael Keaton in BATMAN (1989), as well as several other Batmen! I hired Aubrey Morse as a teacher. He was in A CLOCKWORK ORANGE (1971). Alan Howard, who is a great actor--OXFORD BLUES was before THE COOK, THE WIFE, THE THIEF, THE LOVER (1989). Alley Sheedy. She was charming and lovely. Amanda Pays--before she married Corbin Bersen. Cary Elwes. OXFORD BLUES really has some wonderful casting. On the set, I once asked Chic Waterson, my camera operator on the film, 'What is it you love about being a camera operator?" He said, "I'm the first person who sees the movie." I had never thought about it that way, but he was right. The Camera Operator is the first person to see the whole movie. He was the first person to see RAIDERS OF THE LOST ARK (1981) and INDIANA JONES AND THE TEMPLE OF DOOM (1984). TV STORE ONLINE: And you actually shot the film at Oxford University? BORIS: Yeeesss We Did!!! I'll tell you....As a kid from Brooklyn--it was quite an experience to be at that place. Elliot got Oxford to give us carte blanche at the school. We could move through hall-to-hall and shoot room-to-room there. Shooting there--it made our little one million dollar movie look like it cost ten million dollars. It was remarkable. I loved shooting there. Over the years following OXFORD BLUES, Elliot Kastner would say, "We should make a sequel." But nothing ever came of it. Then Elliot passed away. And recently, I've been talking with Elliot's son, Cassian Elwes, who also produced OXFORD BLUES, and is practically involved with every movie that gets made today--he's been saying the same thing: "We should make a sequel." We've been looking for a story, and recently I think I've found one. I read several articles that said that the women's rowing team at Oxford just convinced the school to allow them to row the men's course. Until recently, the women's course was much shorter then the men's, and on a different part of the Thames. The women's course is two miles long. The men's is almost four miles long. If the women could row that course, it would be a huge break through the glass ceiling. Well, just this year they did it! The women argued and won the right to row the men's course for the first time in hundreds of years. A gigantic break with tradition. Well, I thought, what if Rob goes back to Oxford thirty-years later to coach the girl's team? What if he comes back to Oxford and becomes the coach who helps them break that tradition and make history? But, how do we make it appeal to the younger generation? So I thought, what if he had a daughter that he brought along with him to Oxford who was rebellious? 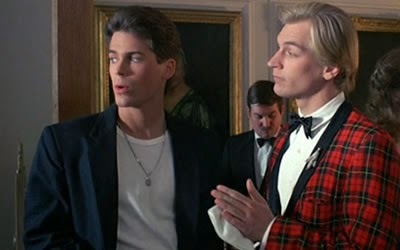 We might even have Julian Sands and Carey Elwes as Dons and the head-master! That way, we could explore the drama in both worlds...the professors with Rob ... and the young international students with Rob’s daughter. I love the potential, and so does Cassian. So we are exploring it together, now. BORIS: (Laughing) That was Cassian Elwes, the Producer of OXFORD BLUES, who drove that Mini-Cooper first, right past the arch. That caused Rob to follow and have his car to crash between the two walls! We wanted to do something that was brash and abrasive. We had the car, and that big shot of it being lowered down with the boom off the boat in England--so we used it as a metaphor for Nick colliding with this world that was new to him. When I saw that archway--I said to someone, "Wouldn't it be cool if the car got stuck there?" So our Art Director had to extend the building walls outward by two inches on each side under the archway for that to happen. 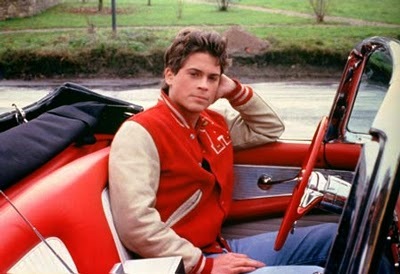 TV STORE ONLINE: And with the car...There's something interesting there with the make, color and era in which the car was made juxtaposed with Rob Lowe in that brown leather jacket...It's almost like he's a '50s persona like James Dean in a way in a contemporary world. BORIS: Absolutely, Justin. I agree with you. TV STORE ONLINE: And there's the arrogance that the Oxford Students pick up on regarding Rob Lowe's American character...Was that something that was conceived as being part of the script from the start? Is OXFORD BLUES a Pro-American Film or an Anti-American Film? BORIS: Well, I was influenced by that idea because I was a fan of the Brando film THE UGLY AMERICAN (1963). The whole concept--this abrasive, brash, American arrogance-- seemed to be the cultural statement of the day. That was, to me, how we seemed to be perceived around the world. We were being portrayed as a people--who were self-involved, not paying attention, and who thought they had a right to everything. That's how I felt Rob's character Nick should be, and to me, Nick almost seemed too handsome for his own good. Everything came too easy for him. TV STORE ONLINE: Can we talk about the end credits of OXFORD BLUES with Rob Lowe standing in front of the mirror trying on all of those fun outfits with that great music? BORIS: (Laughing) That was shot earlier during the shooting of the film as a musical sequence. Every time we tried to cut it into the middle of the film--it just didn't work. It stopped the movie cold. It never worked, but I always liked it. I thought it was fun. That's when the British Editor came up with the idea of using it at the end for the credits. TV STORE ONLINE: Rob Lowe is a very under-rated actor! BORIS: Absolutely! I think Rob is a very sharp guy. I've worked with him on two films--OXFORD BLUES and FRANK & JESSE (1995). I've often thought of Rob as a Paul Newman-type. People didn't always take Paul Newman seriously as an actor because he was so handsome. Newman was a great actor. Just watch THE HUSTLER (1961) or HUD (1963). He was freakin' brilliant. He gave us a language of acting on film. I think Rob is so handsome that sometimes he isn't taken seriously as a dramatic actor--but that's why he's so good at comedy too. He's the master of "Smarmy." He's remarkable, and he was there with us during the shooting of OXFORD under incredible conditions. That was Rob out there in the freezing cold in just a t-shirt rowing. in FRANK & JESSIE he did tremendous work. He's remarkable.